We’ve created a baked donut recipe with gluten-free and grain-free variations that we hope you will go nuts for. Forgive the pun; we are really excited to share these! We think these are the perfect sweet treat to bring along with you to Easter dinner. Our grain-free recipe is also Passover friendly. 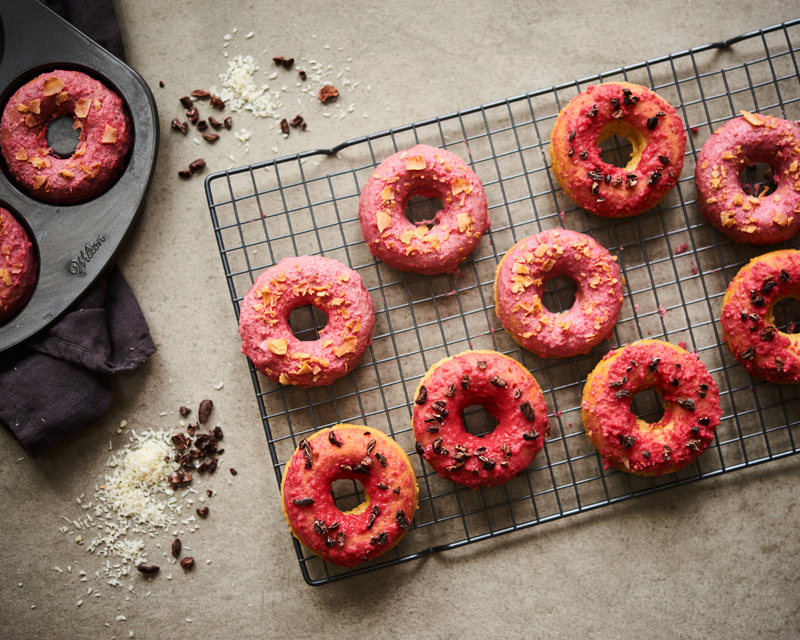 These donuts are packed with fibre rich oat flour – almond flour in our grain-free version – sweetened with maple syrup and topped with a decadent coconut butter glaze coloured with beet juice. Beetroot’s beautiful pink hue comes from a plant pigment called betalains, which is also present in prickly pears and red pitaya. In addition to betalains being studied for their antioxidant properties and anti-inflammatory effects, they are a fantastic option for natural food colouring in lieu of artificial dyes (Gengatharan, A, 2015). If you don’t have a donut pan, no problem! Feel free to bake these in a well-greased muffin tin and proceed as usual. Preheat your oven to 350 F / 176 C. Generously grease a 6 mold donut pan with coconut oil. Combine the dry ingredients – flour, chia, baking powder, and salt in a bowl, whisking to combine. Make a small well in the center of the dry ingredients and add all of the remaining wet ingredients. Stir together until it is a smooth, uniform texture. Equally distribute the batter between the 6 donut molds using a spoon, making sure the top of each doughnut is smooth. Place in the oven for 12-15 minutes until cooked through. Allow to cool completely and gently remove from the pan using a knife. Place peeled, chopped beet into a small sauce pan over low heat with ¼ cup of water. Allow to cook for 10 minutes. Turn off heat. Strain beets from the liquid, and set aside. Combine all ingredients for the glaze except for the vanilla extract and beet liquid in a small pot over medium-low heat until melted. Turn off heat and slowly incorporate beet liquid until desired colour is reached. Stir in vanilla extract. Adjust texture with water or non-dairy milk (if required). To assemble dip the donut in a generous amount of glaze. Top with a sprinkle of toasted coconut flakes or cacao nibs if desired. Enjoy! You can use 1 tsp of beetroot powder to colour your icing if you have it on hand. Repurpose the cooked beet in a salad or smoothie recipe. You can make your own coconut butter by blending 2-3 cups of unsweetened coconut flakes in a high-powered blender or food processor until it resembles a smooth paste. We hope this recipe has you thinking pink. Drop us a line at @livingkitchenco if you try it out!